While you may think there’s nothing better than a perfectly cooked meal, how about a beautifully matched glass of wine? Find out everything you need to know about food and wine pairing. Fact: There’s no right or wrong with wine and food pairings. While wine snobs may argue over their so-called rules, it all comes down to taste and it’s absolutely your privilege to team any meal with any drop of your choice. That said, there are some general guidelines that can result in very tasty pairings if you need a little help. The old “white with white” and “red with red” parameters ring true. 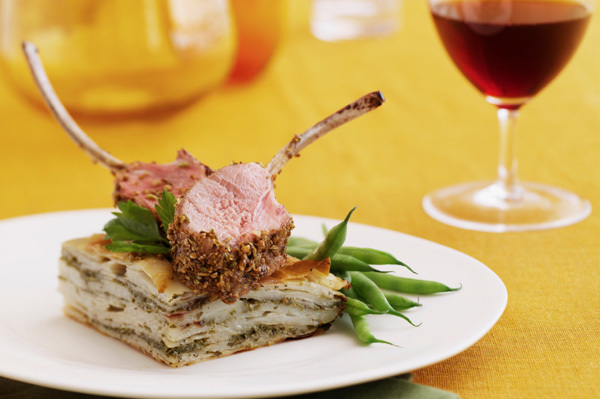 A roasted rack of lamb goes beautifully with an intense red wine, while a delicate fish is complemented well by a light white wine. While pairing like with like, contrasting matches can also work well; for example a rich dish with a less complex, dry wine. Once again, it all comes down to individual taste. The aim is to bring out and highlight the flavours of both, so don’t be afraid to ask for advice, experiment and bend the rules to your own liking. A divine platter loaded up with a variety of soft and hard cheeses, grapes, semi-dried tomatoes and marinated artichokes or mushrooms is a great place to start your wine-matching adventure. Experiment with the various tastes of the cheeses and wines to see which combinations your palate prefers. Sharp and dry cheeses go well with dry red wines, while blue cheeses are complemented by sweet dessert wines, and creamy cheeses taste great with Champagne. Generally, chicken follows the like with like rule, meaning that it goes beautifully with white wines such as a Riesling or Pinot Blanc. However, roast chicken is a famous exception to this rule, with many wine lovers believing it matches a red wine best. Try it with a Pinot Noir or Merlot. Once again, the colour matching rule comes into effect when matching wine to a pasta dish. Tomato-based sauces are great with red wines, while white cheese sauces go well with whites like Chardonnay. While many Aussie men might say that an ice-cold beer is the best match for a barbecue feast, wine can taste just as good. Go for a simple wine with less complex and intense flavours so that it doesn’t compete with the smokiness of the barbecue meat. A glass of Shiraz can be a great partner to a beef burger or barbecued sausage. There’s nothing quite like the delicious pairing of a quality steak and a glass of red wine. A strong drop like Cabernet Sauvignon or Shiraz is a good bet for first-timers.